The Utah Department of Work Force Services releases data on current jobs and unemployment for the state on a monthly basis. Below is the latest video detailing the most recent employment data for the month of December. The state of Utah maintained a 3.2% unemployment rate ranking below the national average which also held at 3.9%. 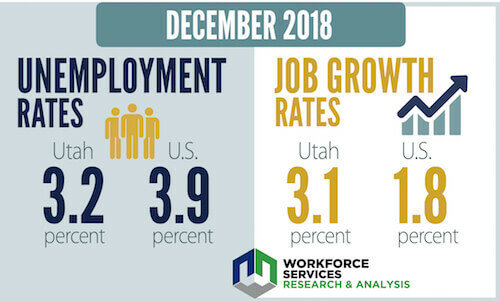 Utah also reported 3.1% job growth (compared to December of 2017) rate against the 1.8% national growth rate. Thanks for the input, Braden and Alexis!